Every year, Dominion’s employees set out with the goal to make a difference in the lives of others. It is engraved into the core of the company that together we work hard to give back to our communities and help make a real difference in the lives of others! Our communities gather together several times per year to fundraise for a cause that is special to Dominion. We have had picnics, poker runs, pool parties, you name it! Our team uses this as an opportunity to gather with the families that reside in our communities, and celebrate raising awareness for a cause we have all been impacted by in one way or another. 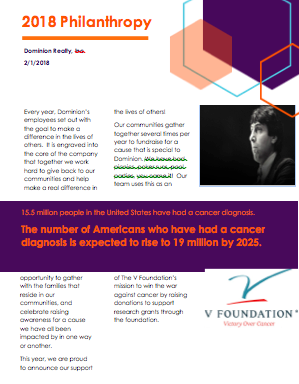 This year, we are proud to announce our support of The V Foundation’s mission to win the war against cancer by raising donations to support research grants through the foundation. Learn more about the V Foundation.